I love fall! I love Halloween and Thanksgiving. I love the colors of fall and the smells of the food that you seem to get only this time of year. One of my favorite things about fall is Pumpkin Pie. Every Thanksgiving I make Pumpkin and Pecan pie for the pot luck dinner we host for our friends. This year will be a little different as I'm not really eating the same foods I've eaten in the past. So I've been thinking about to do with my traditional foods and my non-traditional eating style. 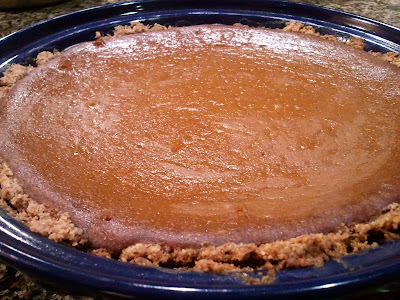 The more I thought about Pumpkin Pie the more I realized that it is very easily adaptable to Paleo eating. I've seen some recipes floating around lately with some interesting ingredients used to make pumpkin pie, but I think Pumpkin Pie is easier than that. For the crust, I used almond flour, coconut oil and shredded coconut. For the filling I used pumpkin puree, coconut milk, pumpkin pie spice, eggs, honey and vanilla. That's it. 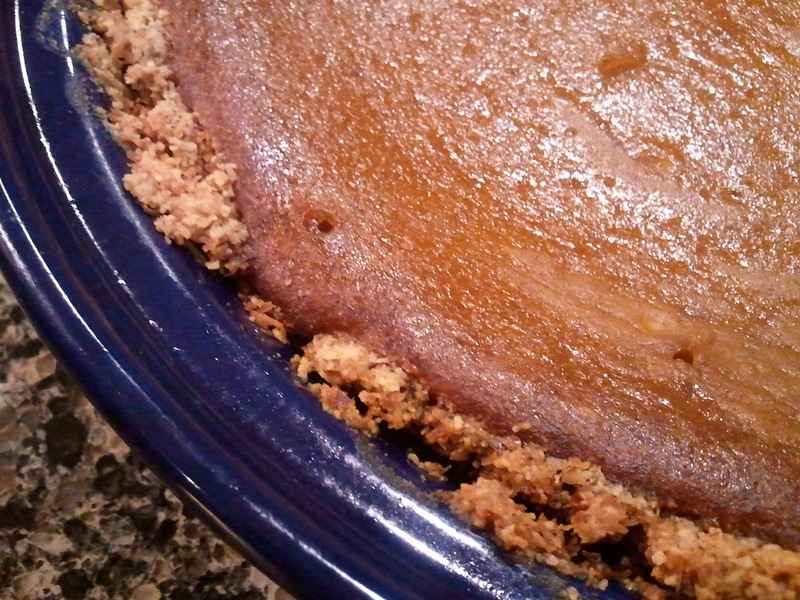 The crust is the main difference between this version and traditional, but it's really a lot like a graham cracker crust. The filling is virtually identical to the original with only the coconut milk substituted for regular milk and honey substituted for sugar. Simple, easy and tasty. The kids didn't even know I'd changed the recipe when they had their dessert tonight. So I'd say that's a success! Mix all crust ingredients then press into a pie pan forming the crust of the pie. Bake empty at 350 for about 10 minutes. Mix all filling ingredients then pour into baked pie crust. Bake at 350 for about an hour until the middle doesn't jiggle when you gently shake the pan. Turns out that the crust is very coconut-y with the shredded coconut. It's more like a pumpkin coconut pie, which is good, but not like traditional pumpkin pie. So I'm going to work on another one with all almond meal or maybe almond meal plus coconut flour. I'm not the backer in the family, but I guarantee I'll be requesting this pie for Thanksgiving. Thanks for posting! I'm curious about the omission of eggs. 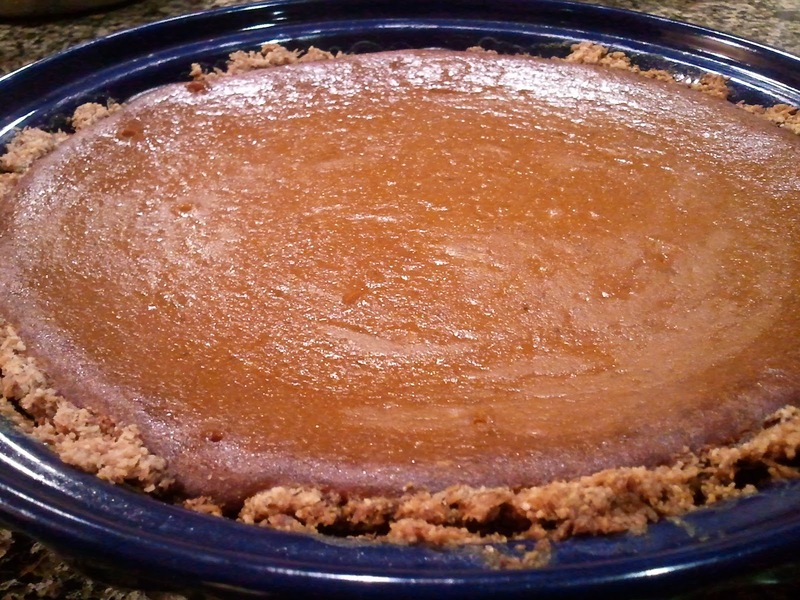 Pumpkin pie is traditionally a custard pie, and eggs are so darn awesome, unless you're allergic, of course. How does the filling hold up without eggs? I assume it doesn't puff up? Sara, thanks for the catch! I listed eggs in the paragraph above, but forgot to list the eggs in the ingredient list! It's fixed now. Sorry to everyone who may have tried this earlier! Ah! That makes more sense, and I'm ready to try it. I'm excited I'll be able to do this at Thanksgiving this year and not be regarded as crazy, since my dad has recently given up gluten, and nobody ever argues with him. Yay for wheat-free pie! How many eggs are used in this recipe? I see about the eggs...sorry...also, how many ounces are in a can of coconut milk? I used a 14 oz can of Coconut milk. I'll add that info to the recipe above as well. The 1 C of Coconut Oil seems like alot - is that correct?? Yep! 1 C of coconut oil is the binder for the crust to hold the meal and shredded coconut together. I tried making the pie crust, but it did not hold together at all. I think perhaps 1 cup of coconut oil is too much? The crust did not harden even though I baked it for about half an hour (I'm not sure exactly how long because I kept increasing the time by three minute intervals). Eventually, I took it out of the oven because I was afraid that it would burn. Hi Serenity, the coconut oil will harden at room temperature or below. So put it in the fridge for a few minutes or let it sit on the counter to harden. Then you can add your filling and bake that. Hope that helps! Last year someone said that the crust was almost a dessert in and of itself like a macaroon. So this year I made extra crust mixture, put it in a pie pan, drizzled it with melted dark chocolate and put it in the freezer to harden up. I broke it into pieces when it was hard and it was the best cookie ever!